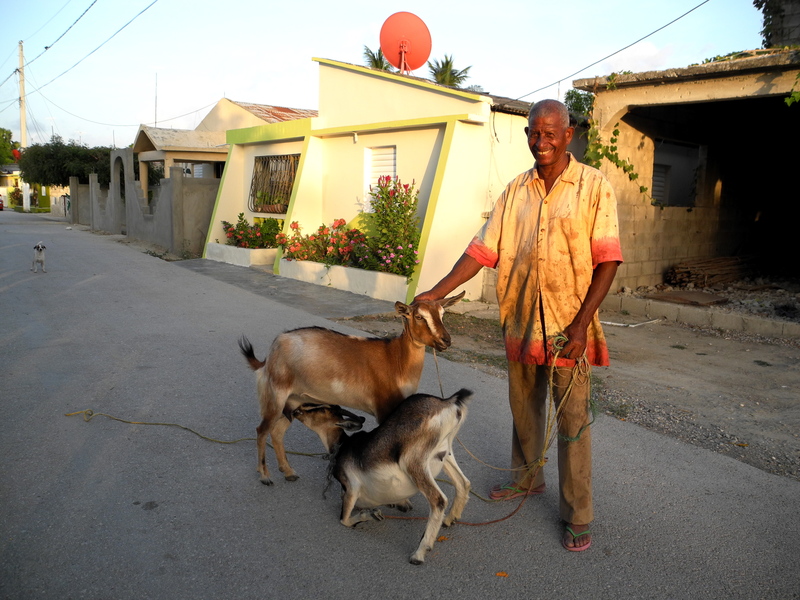 Papaye is 68 years old, and has lived his entire life in Pescadería. 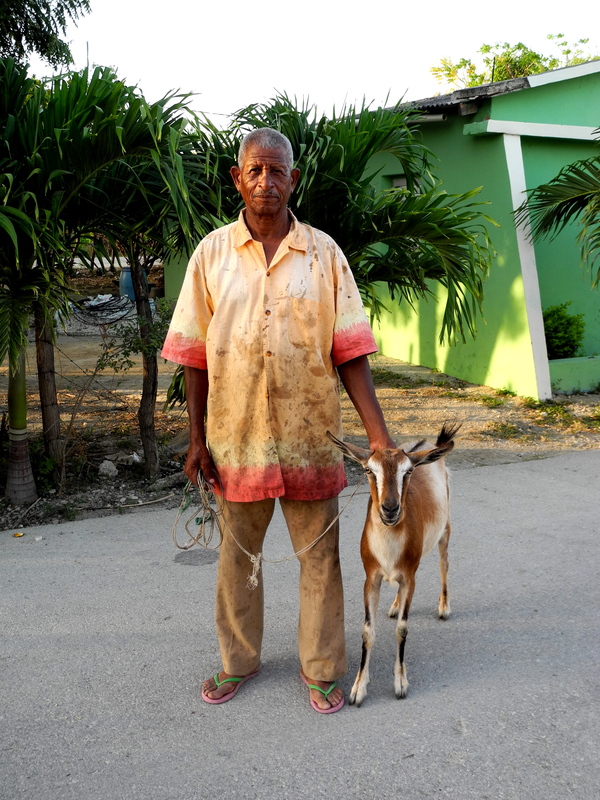 As the oldest socio of La Cabrita, he is my favorite person to share a cup of coffee with. We are both addicted to the stuff – he takes his with too much sugar for my taste or his health, and he nearly cringes when I sip my cup of spiced bitterness. But regardless of the sugar content, for us coffee opens the door to an endless array of conversation topics. We’ve developed a good amount of confianza – I can ask him questions without him thinking that I’m crazy and vice versa, and we’ll give each other honest answers; he shares wise advice and life stories with me, and I enlighten him with cultural differences between the US and the Dominican Republic. It’s a good trade, and the coffee buzz makes it that much better. One evening he saw me walking and invited me to join him. Without question I hoped into the back of his son’s truck – they were going to visit his cows, and I hadn’t been to that part of town before. The trail was dusty and rugged; the farmers who had their land located along that road had their work cut out for them. We reached where he kept his herd, and I was happily surprised to see that his cows didn’t look as famished and thirsty as the landscape; they weren’t fat, but they looked satisfied gnawing away on fermenting sugar cane. He cleaned and filled their water tubs, and shut the barbed-wire fence that led to the larger, grassier part of their turnout, settling them in for the night. He explained to me which ones were related, who was pregnant, and which gave the most milk, and then we got in the truck and started back towards town. I thanked him for bringing me along, but he retorted with a response that I don’t think I’ll ever forget. His youthful eyes glistened wisely, recognizing that what he just described to me had really hit home. Though what he said portrays a deeper implication than a simple visit to his cows, Papaye’s words concisely summed up much of what I’m witnessing and learning here about the relationship between culture, development, sustainability, and human existence. Living and working alongside people like Papaye has made me realize that while American culture conditions selfishness, Dominican culture emphasizes solidarity and selflessness. How much of what we’ve come to know as ‘culture’ is developed out of the necessity versus the gratification of a tradition? Does the level of a country’s development shape the morals of its citizens, or do those very morals determine the amount of progress a country makes? There are Papayes all over the world – spirited people who work tirelessly to provide for their family; who crave and seek new knowledge, and embody perseverance, humility, and ingenuity. They go to great lengths to gather the fruits of their labor, and whether it is information, food, or money, they’ll share it others so that those people also have the opportunity to grow and sustain the cycle. Watching Papaye work, especially considering his age and work ethic, motivates me to be a more selfless person. He has helped me to realize that while I might not have too many pesos in my bank account, that I am rich in many other ways – my education, health, spirit for adventure, and upbringing to name a few. I am fortunate, and it is only fair to share what I can with others who may not have had the same opportunities as me. For people like Papaye, I will always be inclined to bring something to the table, be it as simple as a cup of coffee. Helloooooo world! Currently writing to you from my bed in Santo Domingo. Yup, we’re back in the big, bad capital. We left Peralvillo yesterday morning around 9:30; I was a complete mess – can’t believe that 5 weeks of CBT went by so quickly! I couldn’t have asked for a better host family experience. They were welcoming, entertaining, comforting, generous, fun, and interesting to talk to; they treated me like a queen, taught me how to dance, opened their home to me and my fellow trainees, helped improve my Spanish, and shared Dominican cooking tips. Blood-related or not, we are most certainly family 🙂 Because we had so much confianza, jokes, teasing, and/or sarcasm were not uncommon. For example, when I’d have to leave the house for training, instead of saying hasta luego or adios or nos vemos ahorrita, I opted for hasta nunca (bye forever). By the end of CBT, all of my neighbors were saying it too! I explained to them that even though I say ‘bye forever’, I’ve always come back. So, when I bid them hasta nunca when I left yesterday morning, I made a promise to both myself and to them that I’d return. I believe I mentioned in a previous blog post that we were going to attend the Construye Tus Sueños Regional Conference this weekend. CTS is a CED initiative that motivates entrepreneurship in and teaches business skills to youth. Kraft Foods, producer of Green & Black Chocolate, took particular interest in Construye because their product is made entirely from 100% organic cacao that is grown right here in the Dominican Republic. They realized that it was important to invest in the communities their cacao was grown in by making them more viable places for youth to stay and work. As opposed to leaving to find work in the city, Construye motivates youth to open a small business in their own hometown. Given all of this, CTS is the only Peace Corps initiative worldwide that is funded by a private or public business – Kraft has offered to fund Construye for at least the next three years. Pretty cool stuff. Unfortunately, not everything went as planned, and the conference was postponed until further notice. BUT, seeing as Peace Corps demands flexibility, we held our own mini conference on Friday in Peralvillo, which turned out to be a great success!